If you haven’t tried instance leveling on World of Warcraft yet, then you owe it to yourself and your toons to try it out. There is truly no faster way to get to level 85 than to instance level for all of your playing time. It doesn’t matter if your character is DPS, a healer, or a tank, instance leveling will get you to the top the fastest. However, just as DPS, healers, and tanks all have their own very specific roles in dungeon groups, they all have very specific techniques when it comes to using the dungeon finder. DPS, or Damage Per Second, characters are a dime a dozen because it is far easier to just deal damage inside the instances rather than taking a leading role like a tank or holding the lives of your fellow party members like a healer does. 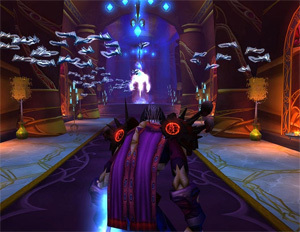 Running a DPS toon through the dungeons is the perfect way to learn all about WoW and how to work together as a group. That being said, DPS characters usually have a very long wait for an instance group. This is why DPS characters will find instance leveling to work the best if they run quests during their downtime. This basically means that DPS characters should queue for an instance the moment they log on and then hit the quest trail. For new players, this is also the perfect way to experience a little bit of the old World of Warcraft leveling system that we all had to deal with for so long. However, a quick comparison of how many levels characters will get by questing alone will show exactly why instance leveling is a necessary part of getting to level 85 in a timely fashion. Tanks are the opposite of DPS because very few people are comfortable tanking. Tanks have to hold aggro on the mob inside the instance while DPS is raining down the destruction. This can be quite difficult when it comes to some of the DPS classes that also throw down a lot of threat. Most tanks also have to have a general idea of which way to go inside the dungeon because it’s pretty much up to them to lead. They have to know how much of a mob their group can handle and be able to formulate strategies of where to pull the mobs to. Because of all the responsibility involved in tanking, the ratio of tanks to DPS is generally pretty low. It’s so low, in fact, that there usually aren’t enough tanks to go around. This is why tanking classes will almost never need to do any quests outside the dungeon. It’s pretty much an instant queue for tanks when it comes to the dungeon finder, so tanks should limit the quests they do to only the ones needed to progress in the game. Healing classes fall somewhere between tanks and DPS. They may have to do some quests, but they will probably have to do far fewer than the DPS classes will do. If you’re a healer who’s instance leveling, then just play it by ear. Be prepared to do a few quests, but don’t plan on doing a lot.